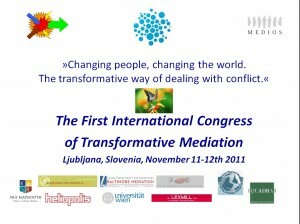 The Congress, which was intended to support the development of mediation, harmonization of the transformative mediation in the Slovenian territory and the methods of alternative dispute resolution, was held in the beautiful atmosphere of Hotel Lev (5*) in the centre Ljubljana. The honoured guest speaker at the Congres was Mr. Joseph P. Folger, founding father of transformative mediation and co-author of the book “The Promise of Mediation: Responding to Conflict Through Empowerment and Recognition”, which represents the ground literature work concerning transformative mediation. The Congress was held in English and Slovene language. Interpretation was provided for the plenary part of the Congress. One day before the Congress on 10. November 2011 Joseph P.Folger, PhD was leading an exclusive seminar on Transformative Mediation entitled: “Transformative Mediation: Core Principles and Practice”.